Few years ago rapyuta was one of the strongest masters on KGS. He is not active anymore. This game is 4 years old. The handicap was too big for White. if you play on such a big handicap. 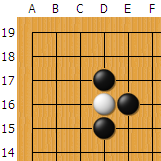 Black's spirit was completely different!